Marshall was not a factor in Green Bay. How will he hold up against St. Louis? Jay Cutler needs better protection this week. The Bears defense must get to Rams QB Sam Bradford. There has been enough talk and enough written about a football game that was played over a week ago. The Bears losing to Green Bay isn’t the end of the world, despite how much the fans and media want to dissect every play in agonizing detail. Right now, the next game against the St. Louis Rams at Soldier Field is all that matters. Of course, you want the Bears offense to play better. To that end, the team did make a change with the offensive line — left guard Chris Spencer will sit and Chilo Rachal will be inserted. Both players battled for the job during the pre-season. There are no assurances that Rachal has cemented the job. “You are never comfortable, I am mentally going in to execute and dominate to keep the spot,” he said. While that change was made, the left tackle will not be altered. For the time being the Bears will stick with Jay Cutler&apos;s favorite "punching bag," J’Marcus Webb, at left tackle. Doesn&apos;t this problem seem redundant by now? It also speaks volumes of their lack of depth on the roster — or the lack of trust in Webb&apos;s back-up, Chris Williams. Either that or the Bears staff wants to give Webb another opportunity against the Rams. 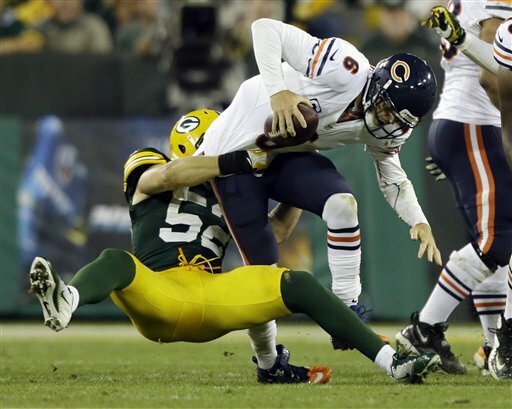 Maybe the Bears coaching staff will change some of the schemes to help Webb protect Cutler. They will have their hands full keeping St. Louis ends Robert Quinn and Chris Long away from the Jay. Sunday&apos;s game is an opportunity for Cutler to rebound and play as he did in the season opener. He shouldn’t (and probably doesn&apos;t) care what the nation and local fans and media think about his actions in Green Bay. But he had better care what his teammates think about him as their leader on offense. You lose your teammates respect and you will lose in the long run. 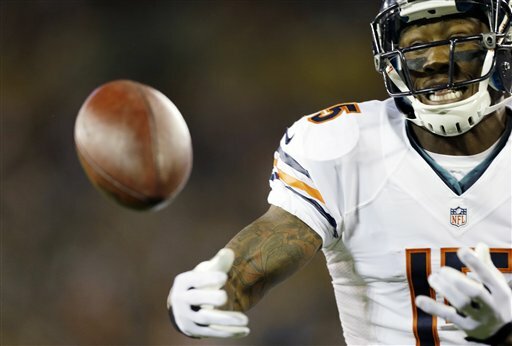 But Brandon Marshall has Cutler&apos;s back. “When Jay is not fiery, that is when I am going to have a problem. That’s when I’m going to want to play with a different quarterback,” Marshall said. He was miffed about the hoopla over one loss. Welcome to Chicago, Brandon! It seems very doubtful that Matt Forte will be lining up at the tailback spot. At least his ankle sprain in Green Bay isn’t as bad as first thought. Expect to see Michael Bush get most of the carries — the Rams give up yards on the ground. Jeff Fisher, the experienced head coach leading this brash, young team into the season, is a former Chicago Bear who spent 17 (mostly successful) years with Houston/Tennessee. 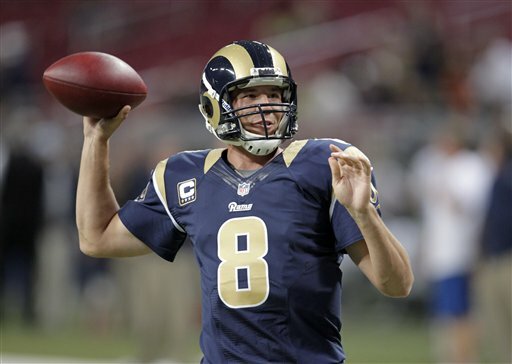 He has a young quarterback, Sam Bradford, who is coming off a 310 yards passing game with 3 TDs in last week’s victory against Washington. Bradford&apos;s favorite target is wide receiver Danny Amendola; he caught 15 receptions in that win. Three-time Pro Bowl running back Steven Jackson keys the ground attack. The Bears defense played a pretty decent game against the Packers with the pressure they put on Aaron Rodgers. They should be able to rattle Bradford if they can get pressure from their front four. The Bears hope the long lay-off between games gave Brian Urlacher more recovery time with his knee problems. Fisher has a solid defensive resume and he does have players that can mix it up on the field. Brandon Marshall expects some activity after the whistle, especially with Pro-Bowl corner Cortland Finnegan. Marshall said this Ram defense “has taken on the character of their leader,” i.e. Finnegan. The Bears need to get the ball to their big wide-out and Marshall has to catch the ball in the end zone when Cutler puts it in reach. A win for the Bears will go a long way to silence the critics for a week. A loss would be unbearable. Don’t forget, Bear fans, to be quiet when Jay and the Bears offense are in the red zone. You may not like him, but he is the Bear quarterback good, bad – or indifferent.